Canvera collaborated recently with Japanese photographic lenses manufacturer Tamron for the very first time to organize a seminar on wedding photography in Lucknow. Both the companies showcased their products and interacted with the local photographers at the occasion held on Dec. 17th, 2016. The event highlighted various photography techniques using different types of wedding specific lenses manufactured by Tamron. Apart from showcasing the latest photobook designs, Canvera’s senior manager BI Rizvi talked about the company’s portal and mobile app, which allows a photographer to view his photobook online. He also spoke about the various cashless and online payment options available at Canvera. This event got featured in the local publication, Inqualibi Nazar. To tap the ongoing festive and wedding season, Canvera has launched its new festive collection. In this regard, the company had held an event in Lucknow on Nov. 22nd, 2016 to unveil its latest products and to discuss the hottest trends in the photography industry. Shri Dinesh Chandra Verma, Chairman, Lucknow Photographers Association graced the event with his presence. Canvera’s Regional Sales Manager (North), Abhishek Mishra expressed gratitude towards the attendee photographers in his vote of thanks. 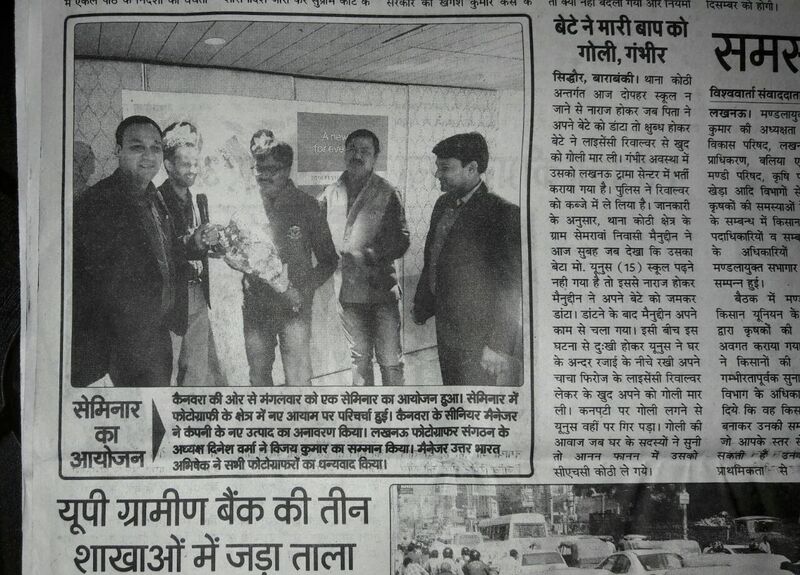 This event was featured in the local publication Vishva Varta. Popular Hindi daily Nav Bharat Times has recently published an article where it spoke about Canvera and its products and services at great length. The article discussed the upcoming trends in candid wedding photography and the latest photography apps available in India. The write-up also stressed on how the craft has evolved through these years. Both the Partner & Classified apps of Canvera got featured in the article which gave a detailed insight on how they work. Other important highlights of the article are pre and post-wedding shoots, teasers and trailers, cinematic videos and so on. How did Canvera manage to engage 15,000+ photographers to augment their business? India's first Wedding Photography Awards receives a record response of over 8000 entries!